It's very hard to be clear, sometimes I spend a lot of time on a sentence and it is still not clear, sorry about that. The text mentions: "If you move the roller head a few mm to the side every new roll, you'll have achieved a high prick density." But it is not important, really. You can either do as I advised (I removed it again, to avoid confusion) or you can roll an area more than once. As you discovered, certain rolling intensities may give better results than others - that is individual. Also, the star-pattern is not bad either. It's just that we now think that the currently recommended way is the best. We very often slightly modify the instructions, this time it was "major" in the sense of recommending a different rolling technique so perhaps we should have announced that here, good idea for next time..
Dermarolling / Microneedling / Will I get results (stretch marks) without using Retin A? You can ask your doctor or a dermatologist for a prescription. Tell him you want it for wrinkles. Alternatively, order our 0.025% Tretinoin cream for 17 dollars. It is a small jar (18 grams) and it will most likely not be checked and confiscated. 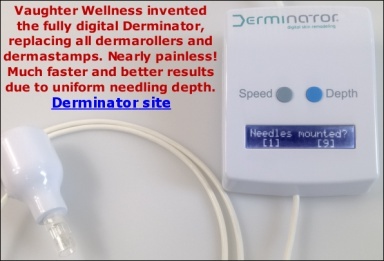 Dermarolling/needling improves stretch marks even without Tretinoin cream. The cream is added to possibly further enhance the chance of improvement. Dermarolling / Microneedling / Needles not piercing skin? You may have very thick skin, however the needles should still penetrate. Not everybody gets pinpoint bleeding, especially not with this size. Please try the roller on the skin on the back of your forearms and see if it gets red. Let us know. Did you buy the roller from us? You can try a 1.5 mm ONE LINER dermaroller both on the lines and on the scar. Your scar is in an area that is painful to roll but I think it will be doable with the one-liner. Apply Tretinoin cream (we sell it) on your dark lines. It increases the turnover of the skin and this should lighten them. The gel contains organic silica and one of its indication is to suppress inflammation so you should not apply it immediately after dermarolling with long needles. A day after is already OK. Ingredients: Purified water, hydroxyethyl cellulose, organic silica (monomethylsilanol), citrus grandis (grapefruit), glycerin and silica. Dermarolling / Microneedling / Can You Recommend The Right Sizes To Order? >years ago but have horrible smoker lines), in between eyes, and forehead. The vertical lines in between the eyebrows: use the single needle. Above the lips: a 1.5 mm dermastamp (this area is very sensitive and you will need a numbing cream. We sell Emla. A 1 regular mm roller around your eyes and on your forehead. Apply a little Infadolan around your eyes every day. You can also use the 1.5 mm dermastamp for the forehead lines. >CHEST: I am starting to develop wrinkles between my breast area. A 1 mm regular dermaroller. A little Infadolan applied every day will also help. Also a 1 mm regular dermaroller. Apply a little Infadolan ointment every day on the back of hands. It keeps them soft, moisturized and protected. >elbows and on the backs of my arms. >area as much as possible. >cellulite and thought that with a combo of A-Ret and Dermarolling I may>be able to reduce the appearance of the cellulite. Tone the muscles in that area. Age spots: A 0.5 mm regular dermaroller and Tretinoin cream (we sell it). For the rest, tell him I think wrinkles on men look attractive so he should keep them..
>am I brave enough to have a tummy tuck. I would like to tighten that apron >area as much as possible. You survived your first roll - congratulations and thank you for yoru feedback. Everything you described is normal and OK. Yes, you can apply the cocoa butter. It is a good moisturizer. Coconut oil/butter is also a good option. BTW coconut oil easily penetrates hair. Massage it into the ends half an hour before you wash your hair. If your ends are extra dry, massage a little into them and do not wash it off. You can also use it for frying (do not use very high temperatures). It is cholesterol-free. Store it cool. Dermarolling / Microneedling / Varicose Veins? I am really glad that dermarolling improved your stretch marks. I would not recommend it at all for varicose veins. You should undergo professional treatment for varicose veins before they get even worse. Dermarolling / Microneedling / Any Item Update Sarah? It will take a while. They have been ordered but it can take until the end of June before they are in stock. Mites and Demodex can not get into the bloodstream, and even if they would, they would very most likely not be able to cause Lupus. Antibiotics can not impair the immune system, apart from damaging the beneficial bacteria such as gut flora. There are certain antibiotics, rarely used, that can impair the immune system slightly when overused but you very likely have not been given such antibiotics, and discontinuing them will very quickly restore proper immune function. Psychics are generally not the best source of health-related information. In case of acne scars and post-acne hyperpigmentation and acne spots, a combination of a 0.5 mm dermaroller (for pigmentation) and a 1.5 mm dermastamp (for acne scars) is the best. A dermastamp is a more targeted treatment, as it can easily achieve a high-density pricking of individual scars - but it is much more laborious. For example, during one second, you insert the dermastamp (that has 35 needles) in and out the skin only once - this is 35 pricks in the skin per second. A dermaroller is rolled approximately once around its axis during one second - which means 180 pricks per second.